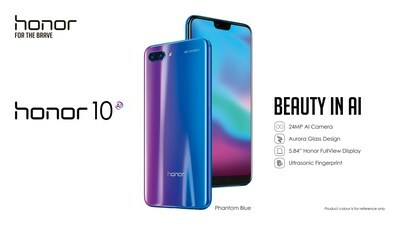 LONDON, May 15, 2018 /PRNewswire/ — Honor launched the Honor 10, its flagship smartphone for 2018, today in London. The launch will bring to life the concept of “Beauty in AI”, and reveal two major ground-breaking and industry leading smartphone technologies to consumers. The first is the advanced AI 2.0 technology, applied chiefly to the smartphone’s dual-lens camera. Second is the Honor 10 CMF1 design, a 3D glass back with a stunning nano-scale optical coating composed of 15 layers of shimmering color. The Honor 10 will be available at £399.99 for purchase at Hihonor from May 15 16:00 BST in select markets including UK, France, Germany, Italy and Spain, with other markets to follow. The Honor 10 is powered by an independently built-in NPU processor. The 4GB RAM and 64GB/128GB ROM storage gives sufficient space to stock all your exciting moments recorded in galleries, apps and files. The Honor 10 also comes with Honor Super Charge35V/4.5A with the 3,400 mAh (typical value) battery, it can recharge 50% of power within 25 minutes.